No visit to Cape Town is complete without a meander through the most beautiful garden in Africa. This garden is more than just a park, it’s a living museum. It is the largest of a country wide network of eleven botanical gardens administered by the South African National Botanical Society. It contains a collection of plants that are used for display, scientific research and education, and play a vital role in the conservation of plant biodiversity. 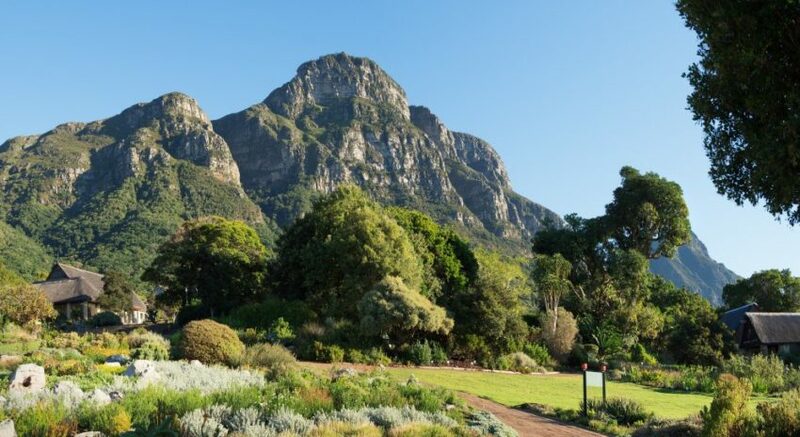 The Kirstenbosch National Botanical Garden is internationally acclaimed as one of the great botanical gardens in the world. 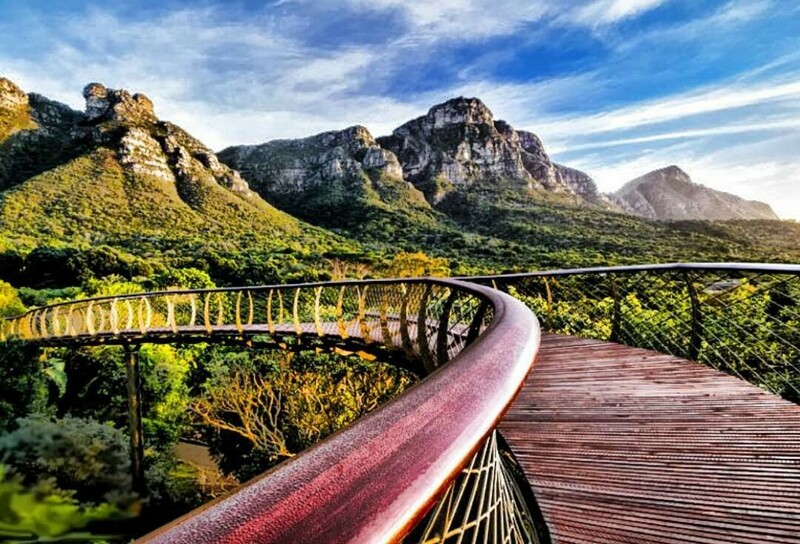 It was declared a UNESCO World Heritage Site in 2004, making Kirstenbosch the first botanical garden in the world to be included within a natural World Heritage Site. Where do I find the Kirstenbosch National Botanical Garden? Situated on the eastern slopes of Cape Town’s magnificent Table Mountain, the estate, covering 528 hectares, includes a cultivated Garden and nature reserve. Kirstenbosch is easily accessible from the M3 if you are driving a hired vehicle. The Hop On Hop Off Red bus stops at the garden 15 times a day during summer (mid Sept to April) and 12 times a day during winter (May to mid Sept), seven days a week. The first bus arrives at 9:50am and there is one every 20 minutes in Summer, every 35 minutes in Winter, until the last one at 4:20pm. What will I find in the gardens? The 36 ha garden merges seamlessly with the Table Mountain National park. Expertly curated and meticulously maintained, it is a treat for the senses. The developed garden displays a collection of Southern African plants including many rare and endangered species. 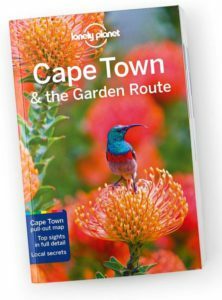 Theme gardens include the Fynbos Garden, Forest Braille Trail and fragrance garden, Useful plants garden and water wise garden. The botanical society Conservatory is a desert house that displays the succulent treasures of Southern Africa, as well as collections of bulbs, ferns and cliff plants. The Kirstenbosch Visitors centre at Gate 1, houses the Kirstenbosch Shop (gifts, curios, clothing – especially useful if you need a warm top), Information desk, main ticket office, an ATM and the Old Mutual Conference and exhibition centre. At Gate 2 you will find the tea room, garden shop and art exhibition venue. The magnificent landscape of Kirstenbosch is the perfect setting for art. 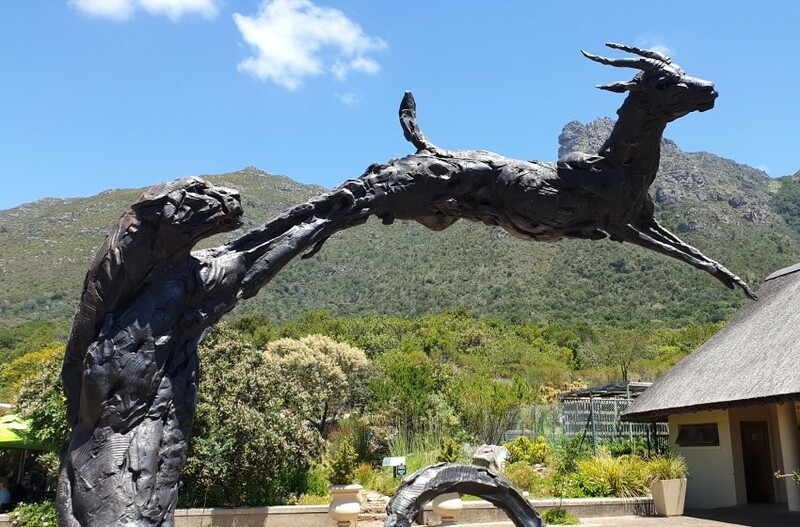 A variety of exhibitions of long and short-term duration, as well as indoor art shows and exhibitions in the various venues at Kirstenbosch, are presented. The Sculpture garden houses a permanent but ever-changing exhibition of African stone sculptures. Each sculpture is original, sculpted by artists in the Shona tradition originating in Zimbabwe, and can be purchased from Mabo Sculptures in the visitors centre. Two animal bronzes by Dylan Lewis can be found at the Centre for Home Gardening. Stroll around the garden and soak up the sounds, colours and scents of the natural environment, or take advantage of the guided tours of the garden. There are free guided tours held at 10am, 11am and 2pm Monday to Friday and 10am on Saturday, leaving from the visitors centre at Gate 1. Self-guided walks are also an option as the garden is well signposted and information abound. Purchase a map when you enter as this will be very useful for navigating the 36 hectares of garden. Kirstenbosch offers two restaurants and a coffee shop that will take care of the appetite built up while exploring. You are also allowed to bring your own picnic baskets into the gardens. 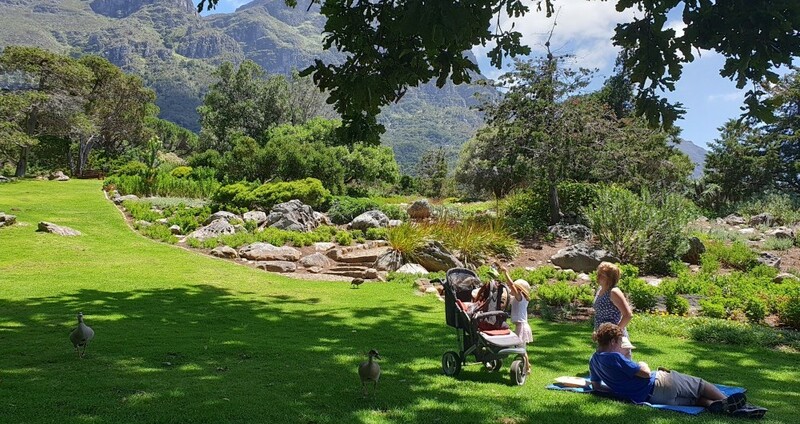 The Kirstenbosch tea room situated at Gate 2 is the perfect venue for the family and is popular with locals and tourists alike. Vida e Cafe is a smaller coffee shop situated at Gate 1 where you can find great espressos, pastries and paninis. Moyo also situated close to gate 1 offers a wonderful African dining experience, complete with tribal inspired face painting. Although you will be spoilt for choice to capture beautiful photos in the gardens we think the views from the Tree Top canopy walkway is made for that special Instagram/Facebook moment. A wonder of engineering and a thing of beauty offering sweeping views of the garden and beyond, is the Centenary Tree Canopy Walkway, a curved steel and timber bridge that winds and dips its way through and over the trees of the Arboretum. Named after the local tree snake for obvious reasons, “The Boomslang” is a must for all visitors. And don’t worry there are no snakes on the bridge LOL. The 130m walkway is long narrow and slender, with a few wider viewpoints areas. 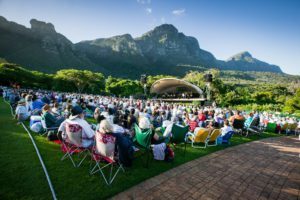 During Summer (late November until early April), the hugely popular Summer Sunset Concerts draw thousands to the gardens every Sunday. Blankets are spread, picnic baskets are opened, and wine is uncorked on the slopes of the north facing lawns which provide a natural auditorium and a stunning view of the mountain. The best local South African bands and artists have appeared here, such as Freshlyground, Johnny Clegg, Goldfish, Dr Victor, Lira and many more, as well as international artists, including Michael Buble, Josh Groban and Cliff Richard. The venue also hosts Christmas carols and New Year’s Eve concerts. 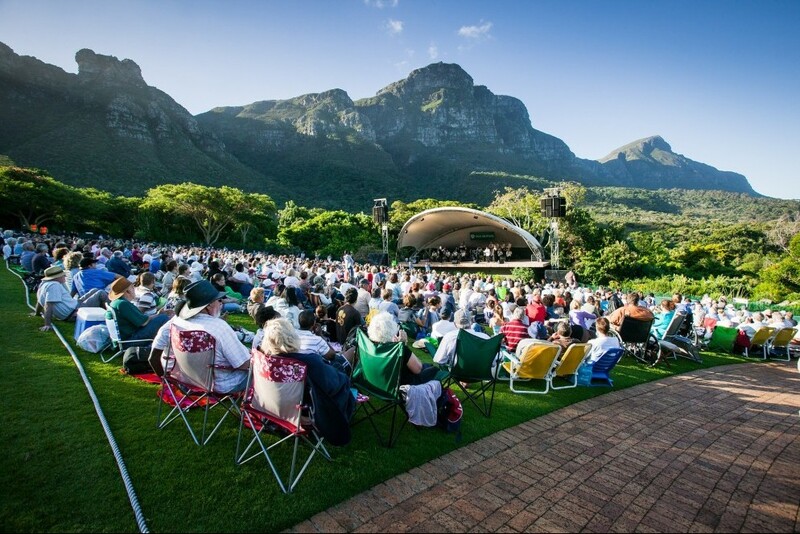 If you are lucky enough to be attending any of the Summer Concerts at Kirstenbosch be sure to come early as the roads become quite congested leading up to the event. 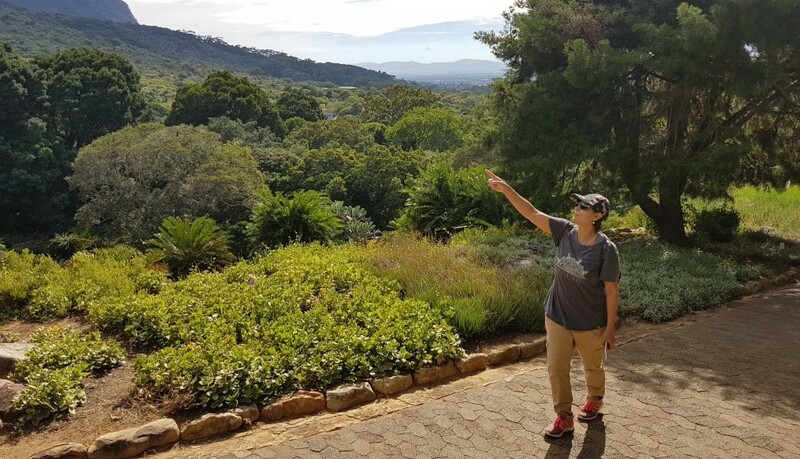 Kirstenbosch is a wonderful experience for all visitors to Cape Town and more so if you are interested in plant biodiversity and conservation. It is child friendly with many areas for the young people to explore and interact with Cape Town’s rich plant kingdom. 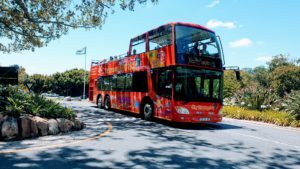 Cape Town Locals TIP: You can get free access to Kirstenbosch, avoid any queues and gte access to the Hop On Hop Off bus if you purchase the Cape Town City Pass, please see our review here. Have a wonderful visit to our garden and please feel free to ask any questions or leave your comments below. I’ve never been to a living museum before, but this definitely looks like something I’d be into. I love the pics, outlining the garden’s scenery which makes me think I’m in a world of epic fantasy rather than 2019. I wish we had more of these in the world, as they appear to be the ideal break from life in general and the living museum concept is just awesome. Hi Todd thanks for visiting Cape Town Locals and your positive feedback. We are really spoilt in Cape Town as we are surrounded by Mother nature everywhere you turn. Kirstenbosch gardens is really special and a wonderful place to go and take in the beauty of Table Mountain and the Cape floral kingdom in all its glory. Hope to see you soon. Thank you very much for your fantastic website. It is amazing that you show people where to start and what steps to make towards their dream-like holidays. I hope more people will know about your website and follow your guidance. Hi Andrey thanks for the wonderful feedback it is really appreciated. 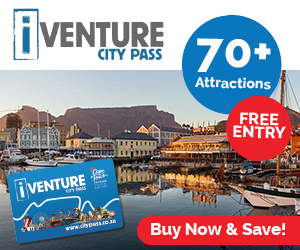 Have just started the website so still growing it out, looking forward to you helping spread the message about Cape Town South Africa as a wonderful tourist destination. This sounds like an amazing spot to visit, I think more people need to take in and appreciate the natural habitat that we live in rather than man made amusement parks. I sometimes wonder if the “powers that be” in this world forget that these natural places provide us with oxygen and many things we need to survive. I would love to visit such an amazing place. Hi Amanda cant agree with you more, that is whats really great about Cape Town, so many natural attractions. From TAble Mountain, to Kirstenbosch Gardens to our beaches you will be awe struck by the natural beauty in Africa. Hope to see you soon. Great post! The images were awesome and very inviting, now if I ever make it to South Africa I have at least one destination I will be sure not to miss! The bronze sculpture was really cool, the artist really captured the movement and the moment where life and death hangs in the balance and it was something that most people would relate to when thinking about the wilds of Africa. Hi Joe thanks for visiting our website and the positive feedback, it is much appreciated. Yes you cannot miss Kirstenbosch National Botanical gardens when visiting Cape Town. The sculptures are amazing and a fitting showcase when you enter the garden. There is so much art scattered all across the garden, you will have a great time. Thank you for this lovely glimpse of Kirstenbosch National Botanical Garden. I want to go there; it truly looks captivating! The treetop canopy walkway looks especially intriguing and I love it when gardens incorporate sculptures into their landscape. I’ll add this to my “someday when I am rich” list of places to go. Hi Theresa you are correct Kirstenbosch is truly captivating, a special place in the centre of Cape Town. You don’t have to be rich to have a fantastic holiday in Cape Town. Book your flight and get here, see you soon. Ok. You’ve convinced me. I HAVE to visit this place someday. Those pictures are amazing! I absolutely love that Boomslang walkway. I’m a biologist by training also. There is so much biodiversity here. This place looks like a paradise. Thanks for sharing! Hi Stone as a biologist you will love Cape Town, so much of interest for you. Put Cape Town on your bucket list and you will not be disappointed. Wow. This place looks amazing. Growing up in a big city (NYC), it has never felt smaller than when I see these awesome mountain landscapes. Im definitely missing out. Who doesn’t love a garden? Hi Max, I have been to NYC and its big city but you are absolutely correct, standing in the shadow of a majestic mountain is something else. We are blessed with Table Mountain and all its energy, biodiversity and scenery that it gives to the City of Cape Town. Come and experience this awesome energy for yourself.